First of all, the bedroom! 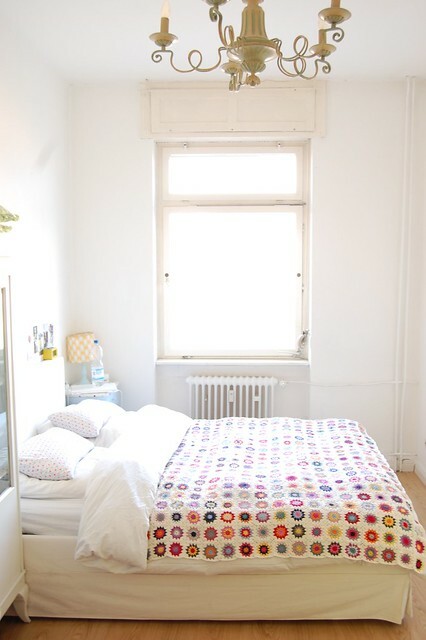 Pictured above, it's a fresh white space that showcases a very colorful granny square quilt. I love the vintage chandelier hanging up above. The window lets in tons of light--very bright and airy for a small room. 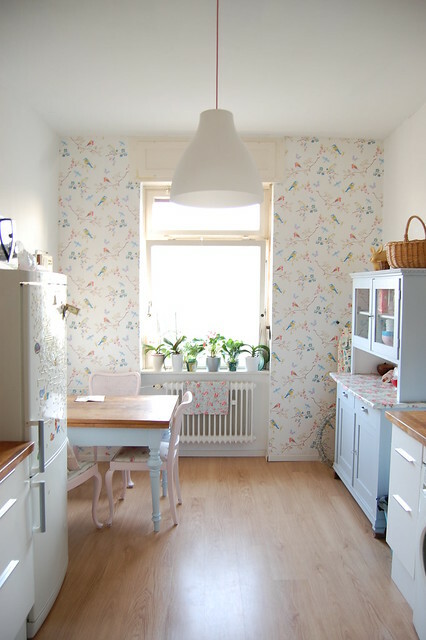 I love love love love love (yes, love times five) the wallpaper. 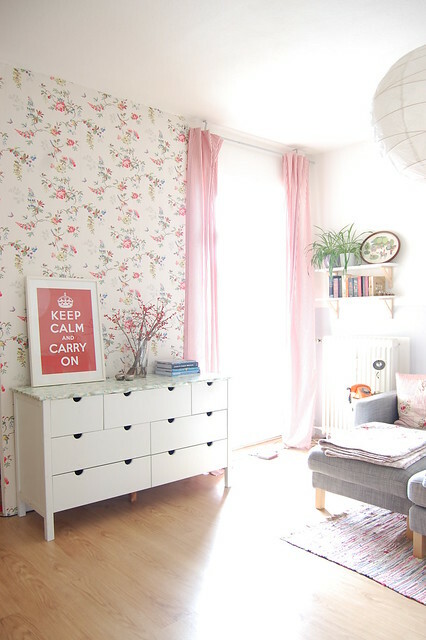 It's ultra feminine, especially when paired with the pretty pink curtains. Fresh flowers on the chest of drawers seem to blend right in, as if growing out of the wallpaper. In the living room sits this chic, heather gray sofa. Accented with a colorful, granny square quilt and lots of floral patterned pillows, it's definitely a cozy place to curl up. I'm also quite crazy about the bright red cabinet. 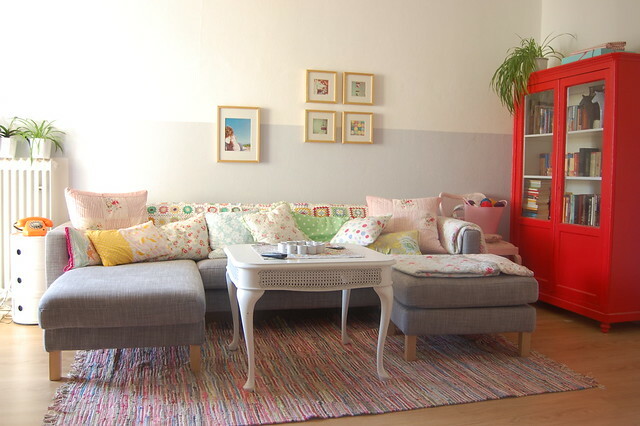 In a space with so much white and pastels, the red color definitely makes a statement. 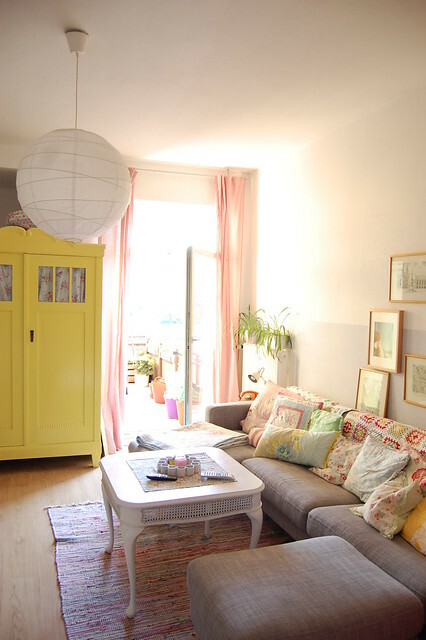 On the other end of the living room (before the wallpaper went up) sat a sunny yellow armoire. Being a little extra tall, I imagine that cute white coffee table would be ideal for setting a laptop on to blog or even some snacks while indulging in tv. 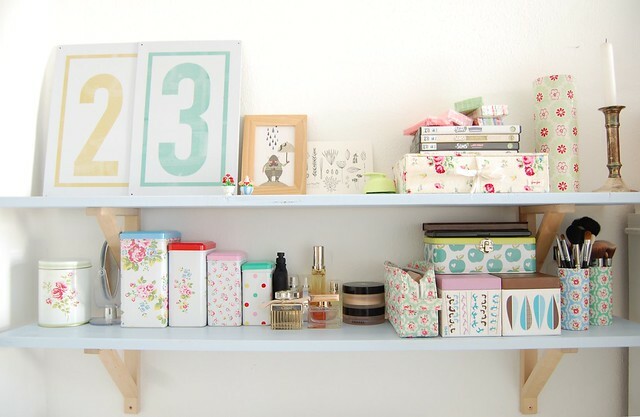 One of the things I really have to applaud Kathrin for is how she styles shelves. She creates the sweetest vignettes! These shelves host charming floral tins, perfumes, printed boxes and cups for makeup, number prints, and a vintage candlestick holder. Sometimes having necessities like makeup and soap within view can look cluttered... but on these shelves they just look lovely. Tall, slim canisters compliment the clean, modern lines of the apartment... while their colorful lids add to the charm. 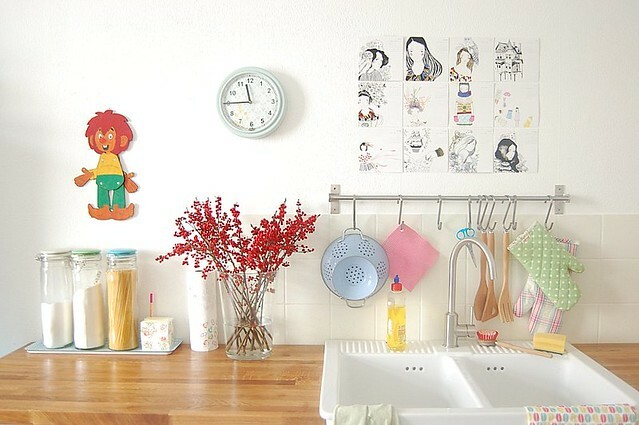 A simple clock, kitschy cardboard doll, and fabulous artwork dress up the wall above the backsplash. Kathrin keeps her oft-needed kitchen tools handy---a pale blue colander, turquoise scissors, light wood utensils, and sweetly patterned oven mitts... all so pretty! Back to another delightful shelf display. On the gorgeous wood counter top are adorable pastel containers, a scale, blender, and coffee mugs. 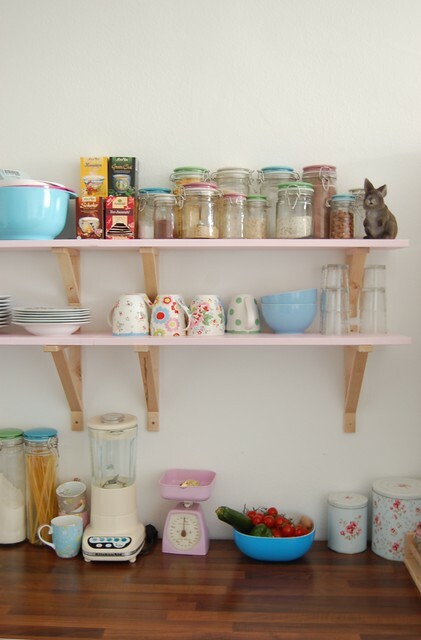 Floral mugs, colorful lidded jars, baby blue bowls, and an unexpected bunny statue occupy the shelves above. I saved my favorite shelf for last. Everything in this vignette has such great color and pattern! 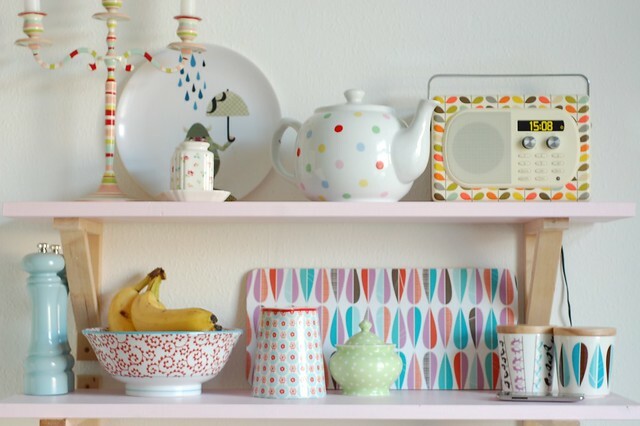 From the stripped candelabra, polka dotted tea kettle, and Orla Keily radio to the spiral designed bowl, colorful cutting board, and cute little canisters. All photos in this post belong to Kathrin of where your heart is. She has many more photos of her pretty home, adorable projects, yummy food, and super cute bunnies. So head over to her photostream and be prepared to be smitten. You should also check out her blog (in English) here: whereyourheartis.net/en or (in German) whereyourheartis.net.